IDC organizes a 13th Century Medieval Weekend in the Camping de Lastours Le Belvédère on the first August weekend. Overlooking the four medieval castles of Lastours, this is the perfect place to immerse ourselves in the atmosphere of the époque and learn more about the history of the area. We will be celebrating this weekend with different types of activities open for adults and children alike. 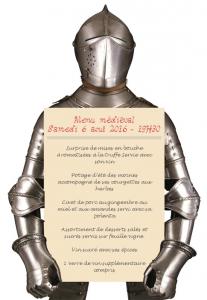 The weekend will feature a medieval buffet showing an array of traditional foods of the area and the century. There will also be workshops for adults and children and our guests can also walk with the donkeys and get the feel of a medieval voyage with only our four-footed friends as travel companions. We will be playing medieval music in the campsite and guests can also see our replica of a guillotine and try out medieval archery. Click here to see the Facebook event page of last year.